A couple of weeks ago, I started a series called "Refresh your makeup bag", and for part one, I gave you a cute lil chart that showed expiration dates of cosmetics. 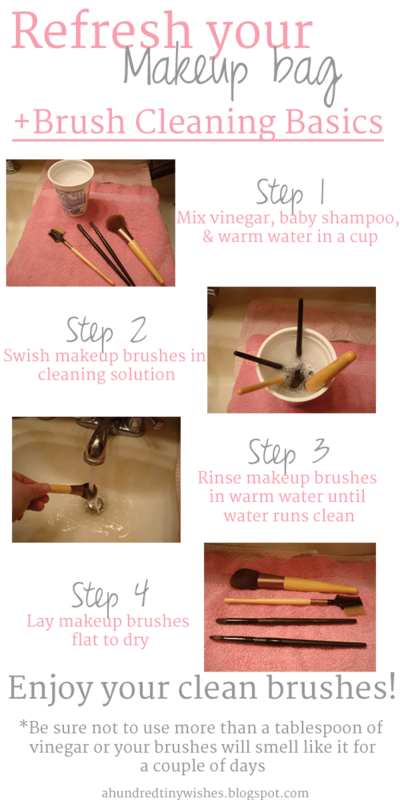 For part two, I am going to show you how I clean my makeup brushes. Please note that there are so many "recipes" for brush cleaning solutions, and they can be found on Pinterest, so there isn't really a "wrong" way to clean your brushes. After reading this chart, I'm sure you probably are wondering why you should actually clean your makeup brushes... So, I will show you! No, that is not coffee... it's the dirty cleaning water from my brushes, and I swear to you, the only stuff I used was vinegar, baby shampoo, and warm water. Yeah... that's why! Thanks for this! I'll be doing this when I get home. I know my brushes need cleaned. Isn't is so gross when you see all of the sludge that comes off of them?! Ughhh! YUCK! I never thought about using vinegar! I like this D-I-Y recipe and will probably use it in the future. I have just been buying cleaning solutions, but what you've shared seems equally effective (and cheaper.) Thanks for sharing this!! I was brought to your blog through Shane's blog, btw.